So festive even the grumpiest of grinches will have to smile! 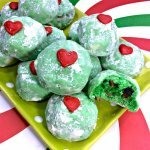 These Grinch Snowball Cookies are a colorful twist on a classic Christmas treat! In a standing mixer, cream softened butter, sugar, and vanilla extract. Gradually mix in flour, salt, and food coloring until your batter is well-combined and a rich green color. Stir in chopped pecans and cranberries until evenly distributed. Form dough into 1 inch balls and place onto a prepared baking sheet (or two baking sheets depending on how large they are). Bake cookies for 10 - 12 minutes. Remove from oven before they start to brown. Allow cookies to cool enough to handle, then roll each in a small bowl of powdered sugar until fully coated. Use melted white chocolate to secure a red heart sprinkle to the top of each cookie. Allow cookies to cool completely and chocolate to set before serving or storing.